OTTAWA — Erik Karlsson enjoyed playing in front of the Ottawa fans again, but he wasn't happy with his current team's performance. 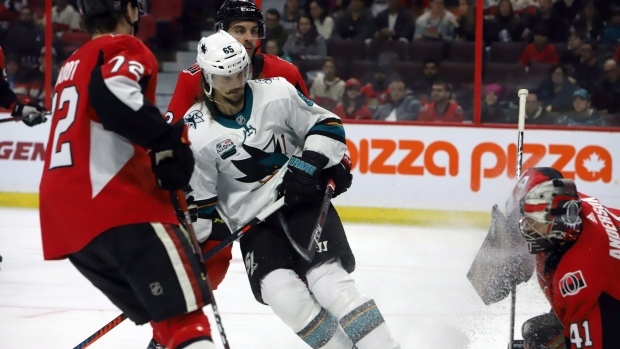 Craig Anderson stopped 36 shots and Mikkel Boedker posted a four-point game with a goal and three assists as the Senators spoiled their former captain's return on Saturday, beating San Jose 6-2 to hand the Sharks a fourth straight loss. Karlsson was playing his first game in Ottawa since he was traded to San Jose in the off-season. The return was much anticipated and talked about all week. "I had a lot of fun out there even though this was not a great game at all and I'm not happy by any means," Karlsson said. "But it's going to be nice to move on now here." The team honoured the two-time Norris Trophy winner with a video tribute during the first period. "There's a lot of good memories that I have from this rink," said Karlsson. "I was drafted here, spent pretty much my entire career here so a lot of positive things so it was fun to see and I was happy I was able to play in front of these guys again and these fans and everything. They did a good job and I thank them for that. It was very kind of them." The Senators have three former Sharks on their roster with Boedker, acquired in the Mike Hoffman trade, Chris Tierney and Dylan DeMelo. "It was a lot of fun out there," said Boedker. "We played really hard as a unit I think. There was three of us in here playing against our old squad and everybody seems to rally behind that so it was a good feeling in the room before and definitely on the ice I thought we played really well." While the Senators downplayed the reunion, they admitted it was strange to see Karlsson on the other side. "It was different," said Mark Stone. "What are we 27 games in? I think it would have been a little different had we played him right away, but we're pretty used to not having him around so it wasn't that different." Ben Harpur, with his first NHL goal, Ryan Dzingel, Magnus Paajarvi, Bobby Ryan and Stone also scored for the Senators (12-12-3). Joe Thornton and Barclay Goodrow scored for the Sharks (12-10-5). Martin Jones made 21 saves. San Jose is 0-3-1 on its current five-game road trip, which ends Sunday in Montreal. "There's no doubt we're chasing the game," said Sharks coach Peter DeBoer. "I think there's a little bit of a confidence issue when you're losing some games like that. You might call it urgency. I would call it a little bit unconfident. We need to find a way to get that swagger back." The Senators took a three-goal lead at 4-1 with Stone's power-play goal four minutes into the third period. Paajarvi made it 5-1, scoring into an empty net, with over five minutes remaining. Goodrow beat Anderson on a deflected shot in front to make it 5-2, but Ryan restored Ottawa's four-goal cushion one minute later. Ottawa opened the scoring as Dzingel picked up his own rebound and beat Jones from a sharp angle for his 11th of the season in the second period. San Jose tied the game with a power-play goal on a play that started with Karlsson and ended with a wide-open Thornton for an easy goal. But the Senators scored twice in a span of 49 seconds to take a 3-1 lead. Harpur, playing his 60th game, wristed a shot past Jones before Boedker beat the San Jose goalie through the legs. "It took me a while," said Harpur. "It was kind of in the back of my mind. I'm not looking to score goals by any means, it's not really part of my game, but to get that first one will be a relief for sure and I think I can play a little looser." A scoreless first period saw the Sharks outshoot the Senators 8-5. Karlsson received a thunderous applause from the crowd of 17,531 during his video tribute, shown on the scoreboard at the first TV timeout. He acknowledged the crowd with a wave from the ice. Notes: D Justin Falk, acquired by the Senators Friday, played his first game Saturday.